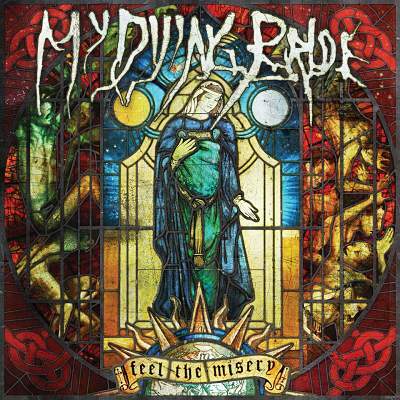 My Dying Bride is a band often accused of laying their drama and melancholy on a little thick for many people’s sensibilities. But earlier this year, vocalist Aaron Stainthorpe’s father passed away. And when this year’s release Feel the Misery opens with the track And My Father Left Forever, only a heartless man could disregard the singer’s sorrow as forced or contrived. The last My Dying Bride album I was particularly engrossed in was 2004’s Songs of Darkness, Words of Light. I loved the album. Wreckage of My Flesh was a powerful, ominous genesis of sickness. My Wine in Silence is, to this day, one of my favourite clean guitar melodies. But around that time, my tastes began to shift into my extreme metal, and when 2006’s A Line of Deathless Kings was announced to dispel with harsh vocals, my interest in the band waned. And so I approached Feel the Misery with more of a sense of curiosity and nostalgia than anything else. Unfamiliar with their work since 2004, all I knew going in was that Calvin Robertshaw would return to guitar for the first time since 1998’s 34.788%… Complete (it appears that only Andrew Craighan played for Light At the End of the World). I never noticed a grand shift between his prior work and Hamish Glencross’ substitution, so I didn’t regard it as much of a change. But from the moment the first verse of And My Father Left Forever kicks in, it is clear that this feels like a newly energised band. Ironic to say that about a gothic doom metal band. The writing is crisp, catchy and appropriately varied, and the lyrics are strong and rhythmic without ever veering to close to being cheesy. For a band which had failed to interest me in their last few releases, each track on this album caught my attention immediately. And from the opening seconds of To Shiver In Empty Halls, it is clear that the harsh vocals are back in full force as well, and have never sounded better. The first of the two major highlights of the album is the title track Feel The Misery. The repetitive, chanting lyrics could easily have come off as contrived, if it weren’t for the seductive empathy in them. When Stainthorpe sings “follow the falling path; take every single lash,” and “love is full of fear; loved ones soon disappear. Feel the misery,” one cannot help but be compelled to obey. The other album highlight is I Almost Loved You. A gentle, minimalist piano ballad, it places Stainthorpe’s vocals far in front in the mix. Listening to the track through headphones feels like a very intimate experience in shared regret (that was an odd sentence to write, but is still an apt description). When the track closed with the gentle piano notes, I felt that this would have been a perfect end to the album. But My Dying Bride had one more treat in store; the 11 minute Within A Sleeping Forest. Albums like this live or die on their ability to create compelling guitar melodies and engaging vocal lines. After enjoying this record, I went back to their last three or four records to see what I had missed. Some notable exceptions aside, very little jumped out and grabbed me on the first listen or two. Granted, I had given them less time than Feel The Misery, but that record had me from the first listen. Whether Robertshaw’s return contributed to the song writing or not, the band does feel more creative and energised than they have in years.